Mental health and suicide prevention apps have gained popularity over the last few years, offering a range of services to help users address their issues or crises. What you may not be aware of is how few of these are evidence-based, frequently updated, or supported by organizations and staff with actual crisis intervention or suicide prevention experience. 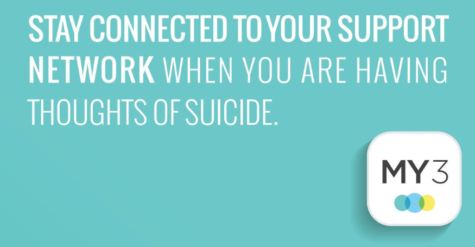 While there are a few suicide prevention apps supported by reputable sources, the My3 app is supported by MHA-NYC and the National Suicide Prevention Lifeline, and can be a helpful tool for supporting an individual in crisis. In the autumn of 2017, MHA-NYC released a new version of the My3 app with updated functionality. The app can now also be viewed in Spanish when the user’s phone is set to Spanish. You can download the app in the Apple App store or the Google Play store. Here are 3 tools in the My3 app that are especially helpful if you’re in crisis or looking to support a loved one in crisis. When a user first opens the app, they’re presented with three circles to add their top three people to contact when in need of immediate support. They’ll also see two additional buttons: one to call the Lifeline and one to call 911. To add a person to the home screen, simply press on one of the circles select a contact in the phone book. Of note, the user can add their local crisis line, therapist, or other mental health professional as a contact within the app. If the user does require immediate assistance, pressing either the button for the Lifeline or for authorities will present a prompt to complete the call. By pressing the menu button in the top corner, the user is presented with several options, the first being “Home,” and the second being “Safety Plan.” Pressing on Safety plan, they’ll find the following options.For each one of the components of this evidence-based safety plan template, users can customize, update, and adapt what they want to include at any time. Each component allows three items in a user’s own words. Obviously, an important part of the development process of a safety plan is collaborating with a mental health professional or treatment provider. The My3 app makes this strikingly simple, in that a user could conceivably use this while meeting with a therapist or anyone else involved with their care. The beauty of this process is that they will then have the entire safety plan on them as often as their phone is on their person. The My3 app also provides users with a curated list of resources based on several categories. The user can select from this list and add certain ones to their personalized resources that would be the most beneficial to them, in crisis and for ongoing support. Overall, the My3 app is a convenient tool, available to anyone with a smartphone, that provides critical support through a safety plan for someone in crisis.